Head Cookie Alan Boysen relocated Cookies of Course to our new location on Industrial Avenue in Vancouver in April 2013, moving from a "bricks and mortar" retail operation to a "deliver cookies to you" one. Alan is still looking for that perfect location, but meanwhile will continue to provide our great cookies to our great customers! Cookies of Course opened in Harbour Centre Complex in April 1984 and moved out April 1, 2013 as a result of the Landlord's decisions to undertake a major renovation of the Mall and only have "nationally based" chain outlets. Being Vancouver's only premier independent cookie store, we were no longer welcome in our home retail location of 29 years. 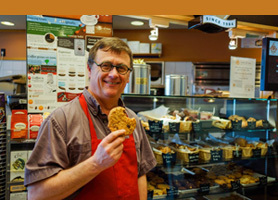 Bonchaz now carries a selection of Cookies of Course cookies at their Hastings Street location just across the street from Harbour Centre Mall - click here. Cookies of Course has been owned and operated by the Boysen family since 1987. 1990 we introduced the "bring your own cup DISCOUNT" for coffee or tea in order to reduce waste going to the landfill, saving about 50,000 disposable cups yearly from going to landfills. As of April 2013, over 1.2 million cups were saved from the landfills. 2004 introduced bulk milk and sugar dispensers in our store. 2006 our company vehicle was switched to a popular gas electric hybrid model which we use for deliveries along with bicycle couriers in Downtown Vancouver. 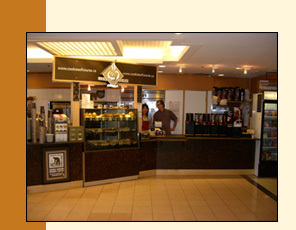 2008 we renovated our store using sustainable materials. We repurposed a number of store fixtures and equipment after our "renoviction"
Until we left Harbour Centre, we regularly donated day old muffins to the Union Gospel Mission and the Lookout Shelter, both located in the downtown eastside of Vancouver. In 1997, Cookies of Course switched to only selling Farmers First Fairly Traded Organic Coffees (far ahead of the "corporate" coffee shops around town). This policy supports environmentally sound agricultural practices in the coffee growing regions such as Mexico and Guatemala and allows these coffee farmers a higher standard of living than conventional coffee growing practices.